Mic capsules are sensitive to mechanical vibrations, which manifest themselves as low rumbles, masking low-level audio signals. The accepted practice is to employ an elastic suspension to decouple the mic from the stand, but an Irish manufacturer has now come up with an alternative. The aluminium M600 is a simple, tiltable clamp arrangement, with a 3/8-inch thread adaptor to convert the 5/8-inch standard thread. The component parts are secured tightly to each other with Allen bolts, and extending through each of the two support rings are three black threaded bolts at 120-degree intervals. These are fitted with a knurled adjustment disc on the outside, and a pivoted plastic flat 'foot' on the inside. 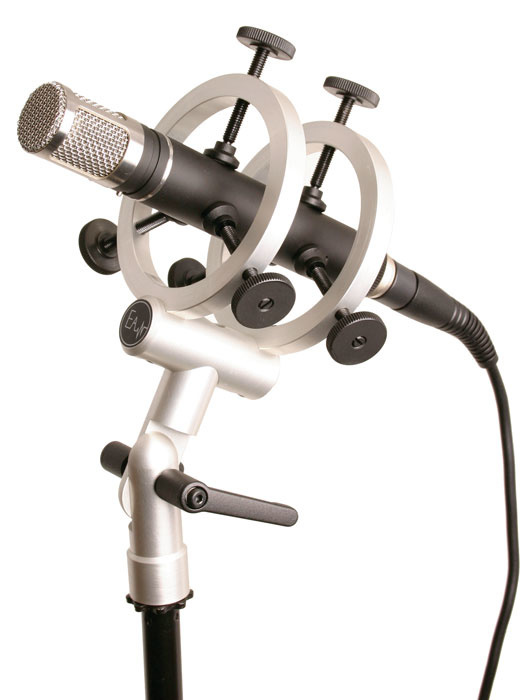 Pretty much any mic with a body up to 65mm in diameter can be secured quickly by passing it through the two rings and screwing the clamps down to hold it firmly. All of the parts and finish are of a very high standard, and the threaded bolts allow easy, quick adjustments. A range of impressive sonic claims are made for this unusual design, but the physics behind it remains unclear (to me, at least). Certainly, mics are held very securely, and such that they cannot vibrate along any one particular axis. However, kicking the mic stand reveals that large-amplitude vibrations are not suppressed at all. Having said that, when testing the mount with a range of capacitor mics, I perceived a change to the lower mid range which often sounded slightly clearer and more detailed, with an impression of tighter bass transients, so the M600, despite its high price, does appear to affect microphone sonics in a positive way. However, I'd say that conventional suspensions are still more suitable where mic stands are likely to be thumped. 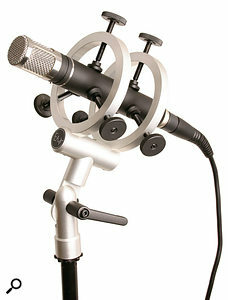 Nicely engineered, and suits virtually any mic. Subjectively, seems to subtly enhance the sound. Provides no isolation from physical shocks. This superbly engineered, expensive mount is capable of supporting almost any mic, but although it claims to offer sonic benefits, the differences are small and subjective. £199/289.19 Euros. Prices include VAT.